Total Built-Up Area - 1076 Sq.ft. 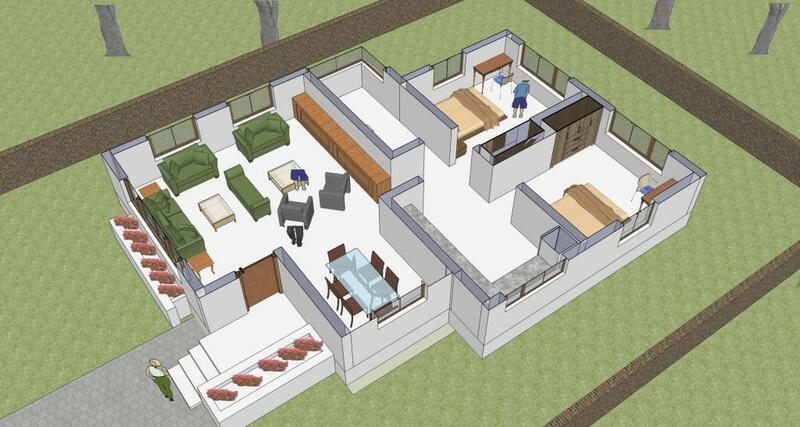 An abundance of space and livability defines this house plan as from the main entrance onwards you are welcomed into a large open Living space which also leads further to the dining area which is comfortable for around 6 people to site and dine together. It’s just the right combination of area available for a small family with two equal sized bedrooms which shares a common toilet. The concept of open kitchen removes the idea of walking in a narrow passage which leads to the bedrooms. The spaciousness of this Home Plan is accentuated along with sufficient number of windows for the cross ventilation of breeze (Indian context). The number of doors has been kept to absolute minimal which in turn effects the cost of the house. This 1098 Sq.ft. house is well suited for any plot which is as minimal in size as 20ft. x 20 ft. This house suits well in local terrains where long rectangular plots are more common to exist.